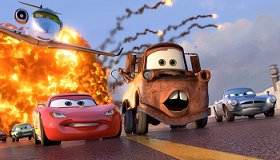 Charming but plot-heavy, Cars 2 won't win the Piston Cup. Former sidekick Tow Mater (Larry the Cable Guy) saves the world and with it the spirit of Radiator Springs, but in the process, the original film's small-town essence is left in the dust. Cars 2 suffers from the same problems as The Hangover 2 (redundancy, international travels, bad things happening when drinks are free) but more troublesome is that this globetrotting adventure speeds so far away from Cars that it suggests the sentiments of the original were disposable. Even with the series' most popular character in the driver's seat, ticket sales won't race past the $244 million earned by the original. But numbers will never be shabby for Pixar; even when they're not breaking records, the animation house boasts the best creative engine in Hollywood. Triumphant from another successful race, Lightning McQueen (Owen Wilson) returns to Radiator Springs to "slow down" with friends Sally (Bonnie Hunt), Ramone (Cheech Marin), Flo (Jennifer Lewis) and best mate Tow Mater. But Lightning's need for rest is mocked by Francesco Bernoulli (John Turturro), who challenges him to a three country world-class race in which their engines will be fueled by Allinol, an alternative fuel designed by British explorer Miles Axlerod (Eddie Izzard). Once Lightning and his Radiator Springs pit crew reach Japan, Mater encounters British Intelligence operatives Holley Treadwell (Emily Mortimer, beguiling) and Finn McMissile (Michael Caine, show-stealing) who notice that there's a suspicious number of Pacers, Gremlins and Yugos on the road. The climactic showdown takes place in England, where Mater and the agents find themselves in epic set piece after epic set piece and Mater Gump unwittingly cheats death again and again. Formally, everything's in order—it's an attractive film with some ingenious action sequences—but the problems overwhelm the pleasures, leading to the conclusion that this film's trouble is under the hood. The first Cars movie had a solid framework. The relationship between its "support local" message was in harmony with its emphasis on traveling dirt roads versus the freeway culture of "speeding through life." The internal contradictions of the sequel, however, are plentiful. Here Lightning McQueen has abandoned his selfishness and embraced the value of friendship, but he's done so in a film encumbered by added spectacle—cultural lampooning in Japan, seaside luxury in Pontecorvo, explosions in London—that embraces the vapid bells-and-whistles which obsessed McQueen when he first said "Kachow!" Mater's good ol' boy burlesque is limiting: abroad, our protagonist is a fish—er, hydrocar—out of water, making us flail for our footing, too. With so much distraction, there's little room for the sweetly meditative elements that are the key to Pixar's charm. Hawaiian Vacation, a short featuring the characters from Toy Story, precedes Cars 2, and unfortunately reminds us of the imagination missing from Cars 2's assembly line manufacturing.